NAD C 338 review | What Hi-Fi? You wouldn’t need to borrow a friend’s hands to count how many £600 stereo amplifiers are capable of streaming music from Spotify, Tidal and Google Play Music with just two taps on your smartphone screen. Indeed, the C 338 is not only NAD’s “most versatile amplifier ever” but among the best-equipped and most flexible we’ve come across from any brand at this price. For that reason, it’d be unfair to overlook NAD’s ambition here. 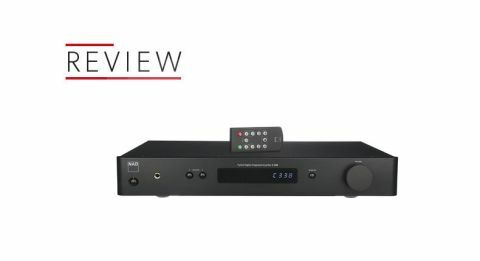 While some of the C 338’s rivals at this price forgo the inclusion of a DAC (the Rega Brio, for instance), the C 338 appears to have more connections than Game of Thrones’ Lord Varys. The ample physical inputs (three RCAs – including MM phono – and twin coaxial and optical connections) are boosted by the inclusion of Bluetooth and wi-fi, via two screw-in antennae. There’s also built-in support for Google Chromecast which, via the Google Home app, opens doorways to streaming from several music services straight from your smartphone or tablet. It’s quick and easy - and, honestly, we wish more stereo amplifiers had it on board. Such a list does indeed make for a busy rear panel, but those who like their hi-fi with a minimalist design will be pleased to know the C 338’s appearance is clean and simple. A 6.3mm headphone output, small display screen, source selection and Bass EQ buttons, plus a volume dial, neatly adorn the front panel. Even so, you’d need to be fairly inebriated to call the NAD a head-turner – and even more so to praise its plastic remote control. Thankfully the NAD Remote app is very usable. The NAD’s unfussy nature isn’t restricted to its physical design, either. There’s nothing wrong with its smooth, easy-listening balance - it gives PJ Harvey’s brooding vocal in Black Hearted Love a pleasantly glossy quality, and ensures there’s no harshness in the wiry guitars or slicing cymbals accompanying it. Such smoothness also proves a blessing when it comes to hiding flaws in thin recordings. Suddenly the pummelling cymbals in The Cure’s Hey You don’t make you want to bash in your speaker’s tweeter. What’s problematic, however, is the NAD’s lack of insight, dynamics and rhythmic precision. It builds nothing on its pleasant tonality to really engage you with your music. Ólafur Arnalds’ skilled piano-playing throughout Eria’s Waltz doesn’t deserve the description “monotonous”, but a dearth of subtlety or dynamic expression mean the NAD fails to communicate the differences in each key. It feels as if he’s merely going through the motions rather than playing to move his audience with tempo changes and ever-fluctuating dynamics. While the class-leading Rega Brio or Cambridge CXA60 charge through the drum strikes puncturing the synths in 65daysofstatic’s Unmake the Wild Light the NAD seems, by comparison, to bow out of dispensing energy or coordinating the multiple patterns with much precision and cohesion. Whatever we listen to, whether it’s Patti Smith or Santana, we can’t help but feel the NAD inhibits music from really blossoming. We prefer the sound of the analogue inputs over the digital, and Chromecast streaming takes the sonic edge over Bluetooth for clarity and insight. We stream Manchester Orchestra’s original electric-heavy version of Top Notch from Tidal, and while the presentation doesn’t have the spaciousness or cohesiveness as it does through the Tidal app on our RCA-connected Naim streamer, it’s clear and detailed enough to let the drums and vocal be heard – and located – over the mesh of electronics. The NAD C 338 may be a very ‘here and now’ amplifier. But the trade-off for plentiful features is a middling performance that doesn’t come close to matching the class-leaders. Our preference is for a better balance between performance and features – achieved impressively by the likes of the Cambridge CXA60. While, naturally, you want a considerable amount of bang for your buck from any piece of hi-fi, that ‘bang’ should be compelling to listen to. And here, it just isn’t.